The Penguin Islands, a stretch of rocky outcroppings off the coast of Namibia once considered valuable for their guano deposits, get their name (and, er, their guano) from Spheniscus demersus—the only species of penguin to breed in Africa. Today, African penguins are at serious risk of extinction; the Academy's Species Survival Plan colony is one of the ways researchers and biologists are working to protect them. Like all penguins, African penguins do not fly; their wings, flat and stiff, function as flippers, allowing them to dive to nearly 200 feet in pursuit of fish and squid. And because African penguins can slow their heart rate, they can remain underwater for more than two minutes at a time. Their coats, which feature a pattern unique to each penguin (like human fingerprints), are maintained by a constant process of preening. During preening, penguins use their beaks to apply oil from a gland at the base of their tails, distributing a waxy sheen over their feathers. African penguins hew to a set of behaviors that will seem familiar to humans, such as establishing strong pair bonds and clear social hierarchies, and using lively, complex communication. In the mainland colonies they’ve established near Cape Town and Namibia, they even interact with humans from only a few feet away. African penguins live in colonies on 24 islands along Africa’s southwestern coast. They are endangered for a number of reasons, including overfishing, avian malaria, and devastating oil spills; their population has fallen by 95 percent since preindustrial times, and continues to decline precipitously. Without intervention, the species could be extinct within 10 to 15 years. African penguins establish strong pair bonds, remaining with the same partner for several years and returning to the same breeding site each year, typically producing two eggs annually. 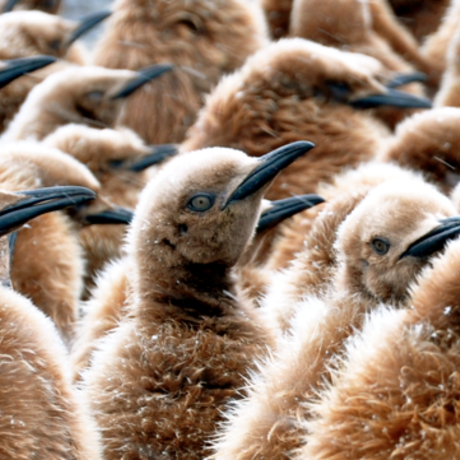 Both parents feed and care for their hatchlings for about a month, after which the chicks join a communal daycare known as a crèche, where they will stay for 2 to 4 months until they develop their juvenile feathers and are ready to go forage at sea with their parents. African penguins can live as long as 27 years in the wild, and potentially longer in captivity. Not for nothing are African penguins also known as "jackass" penguins: they communicate with a loud call reminiscent of a donkey’s. Expression revolves around three kinds of call: the yell, which is used defensively in territorial disputes; the bray (typically accompanied by head-swinging displays), which is integral to attracting and maintaining a mate; and the haw, which partners use to keep in contact when one is on land and the other in the water. Penguin feathers provide a sophisticated personal heating and cooling system. Each feather is equipped with small muscles that can hold it firmly against the body to create a waterproof layer for diving, or maintain an insulating air pocket around the penguin’s core for explorations on land. Where do juvenile king penguins go after leaving the nest? 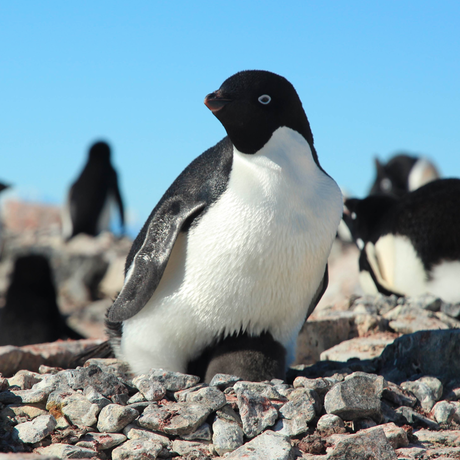 Some penguins may fare better than others as the planet warms. Watch our colony of playful African penguins waddle, swim, flirt, and nest on three live webcams. There is never a dull moment in the penguin exhibit. Watch for these commonly seen behaviors! African penguin antics, 24/7! Download the Academy's Pocket Penguins app for iPhone, Android, and AppleTV. Penguin feedings take place every day at 10:30 am and 3 pm—visit the Academy (or tune in online) to learn more about our Species Survival Plan birds from Academy biologists. Our African penguin work is generously supported by the Frances K. and Charles D. Field Foundation.